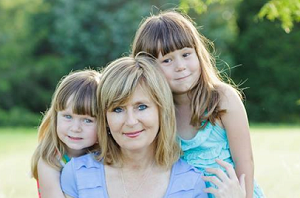 Colette is battling stage 4 cholangiocarcinoma with metastatic disease to her brain and spine. She is a single parent to two beautiful daughters, Emma 6, and Bella 4. Colette was diagnosed in April 2013, and continues to fight the disease with chemotherapy and radiation. This could very well be her last Christmas with her girls, and I would love to make this Christmas brighter for this lovely little family. What is your Christmas Wish? Emma and Bella are everything to Colette! Her wish is to fulfill the Christmas wish lists of her two precious daughters so their Christmas can be Merry and Bright and they can all, at least for one day, forget about Colette’s illness. For Colette, her wish list is short, she simply wants a cure for her disease so she can be around to see her daughters grow up. The members of Angels of Care’s Leadership Team met with Colette Goss and her family and are excited to share more about this special Christmas Wish. Follow Angels of Care to keep up to date with more about this story. We would like to also thank everyone that submitted a Christmas Wish with Angels of Care. We hope you and your loved ones have a truly special Christmas holiday. Nominated by: LuAnn Daniel of Women Rock Inc.